A good night’s sleep can make the difference between feeling rested and feeling tired. For people who are on the trail, a good night’s sleep is important to stay alert and safe when spending time in the great outdoors. 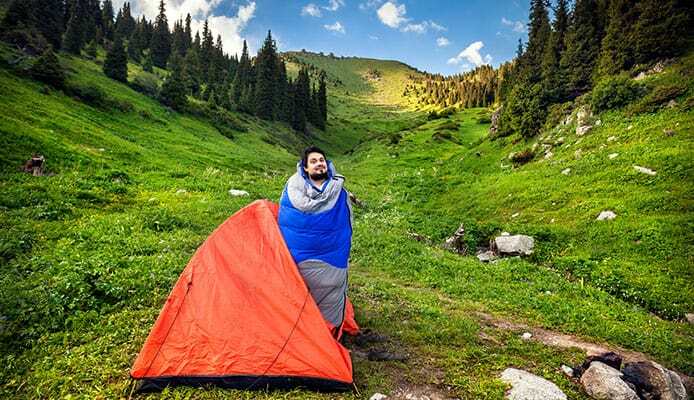 Backpacking tips you can use is to bring a backpacking pillow, which can enhance your night’s sleep on the trail and ensure that your sleep is not ruined. Our list of the 10 Best Backpacking Pillows provides you all the information needed to find lightest and most comfortable design. Not all pillows are made equal, but with our picks, you can choose from the best. We will also discuss what features you should look out for and what designs might best suit your needs. A backpacking pillow will soon be at the top of your backpacking checklist. This Compressible Backpacking Pillow by Therm-a-Rest is ultralight and perfect for road trips, planes, camping, and backpacking. 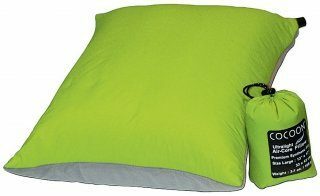 This top rated ultralight backpacking pillow is filled with soft foam that expands to be 4 inches thick. The pillow can be easily compressed to fit into a backpack, duffle, suitcase, or tote bag. The pillow is covered in a soft polyester and can be machine washed. With Therm-a-Rest’s design, getting a little shut eye is easy. This pillow is excellent for tough to sleep places. The pillow comes with a drawstring cover and cord lock, that ensures it stays compressed when it isn’t being used. This Ultralight Inflatable Travel Pillow by Trekology is small in size, but big on comfort. This pillow folds down to smaller than a soda can for easy carrying. The pillow deflates in seconds for fast storage. It also inflates with only 3-5 breaths. You can adjust the lift of this pillow by putting more or less air inside the bladder. This pillow for backpacking features support for the neck and is ideal for back, side, and stomach sleepers. This lightweight backpacking pillow is made of TPU fabric layers that is water resistant. With Trekology’s design you can sleep without worry. The design is slip-resistant that pairs well with an inflatable sleeping pad. This hiking pillow is durable and comes with a 100% Satisfaction Guarantee. 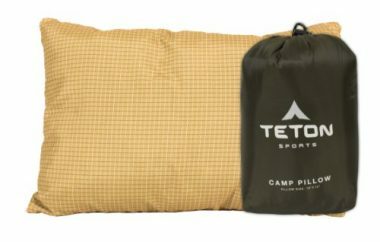 This Camp Pillow for Backpacking by TETON Sports is an extra soft and fluffy pillow that is perfect for relaxation. You can take this pillow for backpacking, camping, and travel. This pillow does not need to be inflated to deliver great neck support. The pillow is filled with SuperLoft Elite 4-Channel fiber fill that compresses small for easy packing but won’t lose any lift. The pillow is covered in flannel and brushed with P5 poly hi-count to ensure that it won’t stick to you or get too clammy. There is an envelope style pillowcase that is washable and brushed for softness. The pillow matches the rest of TETON Sports gear, like their sleeping bags. 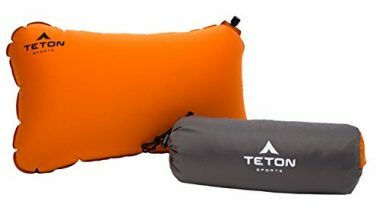 This lightweight backpacking pillow comes with a drawstring bag and TETON Sports amazing customer service. The Aeros Premium Pillow by Sea to Summit is a soft and durable backpacking pillow. This pillow has a synthetic fill nestled between a pillow case and a TPU air bladder. To increase your comfort, this pillow wicks away any perspiration. 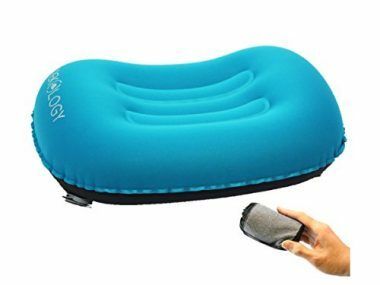 This inflatable backpacking pillow is curved so that it contours to your head for the perfect cradle position. A scalloped bottom edge centers the pillow over your shoulders, no matter what position you sleep in. The pillow will inflate with a couple of breaths and also deflates rapidly. There is a multi-functional valve that keep air from escaping. This is large pillow that gives you room to move around. 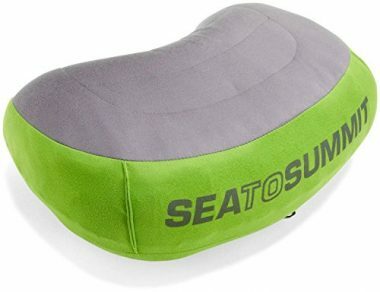 Sea to Summit’s high-performance pillow is great for any outdoor adventure. 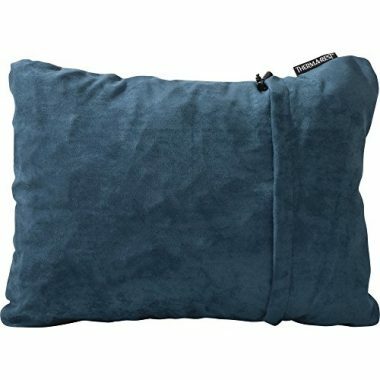 This Bamboo Camping and Travel Pillow by Coop Home Goods is a foam memory pillow that is hand crafted in Los Angeles and built to be taken anywhere. This backpacking pillow is perfect for backpacking because it is compressible into a stuff sack. The compression of this pillow saves you space. The bamboo cover of this pillow ensures that it is breathable, so you can stay cool because it is naturally thermo regulating. This lightweight backpacking pillow is also hypoallergenic and dust mite resistant. The foam is made of CertiPUR-US certified foam. 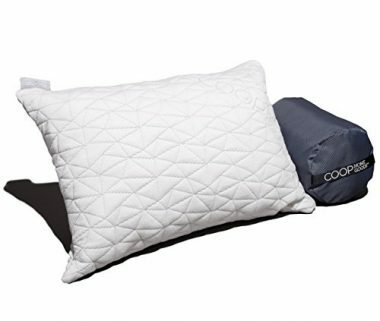 Coop Home Goods ensures that this pillow is small, but as comfortable as a full-size pillow. They also include their 5 Year Warranty for your satisfaction. 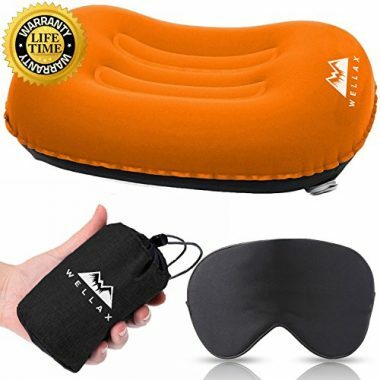 The WellaX Ultralight Backpacking Pillow by Chillax has an improved ergonomic design for enhanced comfort and carrying efficiency. Chillax’s design ensures that you have optimal head and neck support for back, side, and stomach sleepers. This ultralight backpacking pillow is strong and durable in its construction. This pillow is inflatable and adjustable. You can decide how much lift you want, depending on the amount of air you put into the bladder. To inflate and deflate this pillow, you simply twist open the top portion of the double decked air valve. You can inflate this pillow in 3-5 breaths and quickly deflate it by opening the bottom valve. This two-way valve prevents any air from leaking out. The WellaX is slip resistant, so you don’t have to balance your head. The pillow folds down into a small carrying case. Chillax ensures that their product is a No Risk Purchase and they will refund or replace with no questions asked. The Pillow X Inflatable by Klymit features a unique design. This pillow is made of four small triangles that inflate to make a round edged rectangular shape. This inflatable backpacking pillow is ultralight, durable, comfortable, and supportive. It is perfect for camping, backpacking, hunting, and traveling. You can sleep comfortable under the stars thanks to the innovative X design that keeps your head centered on the pillow. This pillow is featherlight and compacts down to about the size of a lighter. You can adjust the height and pressure of the pillow, depending on how much air you add to it. It inflates in 1-2 breaths and comes with a stuff sack. Klymit also includes their Limited Lifetime Warranty. The ComfortLite Self-Inflating Pillow by TETON Sports is a durable but soft backpacking pillow. The ComfortLite does not need a pillow for inflation. Rather, this pillow self inflates. All you have to do is twist the valve open and watch as the pillow inflates itself. This pillow has a microfiber top that is soft to the touch and washable. All you need is to wipe it down with a damp cloth. This top rated ultralight backpacking pillow can be used for any adventure so you can bring comfort to the outdoors. TETON Sports includes their amazing customer service with every purchase. The Core Pillow Ultralight by Cocoon is a new pillow design that features an inflatable core under a layer of premium synthetic fill. This pillow offers support and superior comfort. It packs down to a small size, so it can be easily taken on the trail. With this backpacking pillow you will get a restful night’s sleep. This pillow has a nylon front and polyester back. The air bladder is made of TPU polyester. With Cocoon’s design, you will have all the comforts of home with you in the great outdoors. The Medium Air Pillow by Exped is an extremely packable backpacking pillow. This inflatable backpacking pillow compacts down to the size of a fist. This pillow is easily inflated in just a couple of breaths and can be just as quickly deflated. There are two low-profile FlatValves. One is used for inflation and the other is used for deflation. Thanks to the two-valve design, this pillow has quick deployment and packing to get you on the trail faster. The pillow features a tri-coat polyester fabric that is soft next to the skin. You can sleep comfortable in various head positions because of the indentations and sloping design. With Exped’s design you won’t be weighed down and there won’t be an excuse for leaving a pillow at home. When you are deciding which backpacking pillow is the best to buy, you will have to decide which design and what features will best ensure your comfort. There are differences in each backpacking pillow design that can enhance your night on the trail and make using a backpacking pillow enjoyable. From the type to the shape, every person has their own preference on personal comfort. The best backpacking pillow will deliver maximum comfort in a compact and lightweight design. With a backpacking pillow, you won’t have a reason to not take comfort on the road with you. There are generally three types of backpacking pillows that you can choose from. Each type will have its own level of comfort and packability. The most common types of backpacking pillows are inflatable, compressible, and hybrid. Inflatable: This type of backpacking pillow is, without a doubt, the lightest and most packable design. Inflatable pillows can either be self-inflated or require some breathing work on your end. The inflatable pillow is an excellent design because it starts off small and compact but can expand to quite a large size. Some pillows are so small when stored, you have to mind not to lose it. 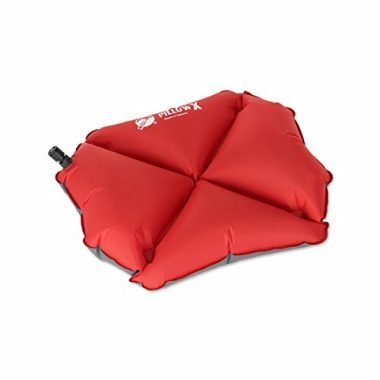 Inflatable backpacking pillows can be easily carried on the trail or stored away. The only downfall to inflatable pillows is that they don’t offer the same comfort level as a real pillow. Nothing can compare to a real pillow, but an inflatable one is great for those who want a cushion for their head but are worried about their packing space. Compressible: Compressible pillows are the most similar type to a standard home pillow. Compressible pillows also look like a standard home pillow, just in a much smaller size. These pillows are set apart in their style because they can be quite high tech. From down and synthetic fillings to special shapes and fabrics, compressible pillows deliver comfort. Compressible pillows will feel the most like a standard home pillow. They can deliver great support and snuggle, while still packing down to a small size. However, a compressible pillow will never be as small as an inflatable design. For backpackers, size and weight is important but if you’re not worried about fitting a pillow, a compressible type is the way to go. Hybrid: Hybrid pillows are an excellent attempt at balancing and combining the styles of the inflatable and compressible pillows into one design. Hybrid designs have an inner air bladder and a padded outer layer. The inner air bladder means that this type of pillow can still compress down but has more support than an inflatable pillow. There are many different hybrid pillows on the market and each will have their own shape, fabric, and air bladders. You should look for two features in a hybrid pillow that can help you determine which is better for you. Some hybrid pillows allow for the padded outer layer to be removed for easy washing. Other hybrid pillows feature one solid design. Removable layers can be great for washing but be careful that you don’t lose it either. Hybrid pillows are great for backpackers who are still trying to save space, but don’t want to sacrifice comfort. In general, most pillow designs will only have a few ounces of difference between them. For backpackers, every ounce can count when they have to carry their gear strapped to their shoulders and resting on their hips. Every bit of weight counts for backpackers, so finding a lightweight backpacking pillow is important. If you are concerned about weight, you should choose the lightest and most compact pillow design. If you are willing to sacrifice a few ounces, you will gain an edge on comfort. Most backpacking pillows are smaller in design to keep them portable, but size is important for a good night’s sleep. If you have a larger head, a small pillow can leave you frustrated and with a sore neck. If a pillow is too small, it can also move around too much, making you play a balancing game throughout the night. You should try to find a backpacking pillow that is similar to the size of pillow you would normally use at home. Though home pillows are rather large, there are many backpacking pillows that are great at being compact for storage and carry but can expand to a comfortable size. Comfort is important in a backpacking pillow because every camper wants a good night’s sleep. While size can affect the comfort of your pillow, so can a sleeping position. A pillow that is too small is frustrating to sleep on because your head can easily slip off. However, some sleeping positions can change the comfort of your pillow too. Many companies go to great lengths to ensure their design will cradle your head and support your neck, no matter the preferred sleeping position. Not all companies are successful in their attempts, so you should try different pillows before you buy.If you are a back sleeper, you shouldn’t have a problem finding a comfortable backpacking pillow. The size and shape of the pillow likely won’t affect you and you’ll have a large variety of designs to choose from. If you are a side sleeper, you will want to pay attention to the shape of your pillow. Shapes that are longer and thicker tend to provide more support for you neck and back, if you sleep on your side. Generally, you should ensure that a pillow is thick enough to support your neck, as this will maximize your comfort. You shouldn’t invest in a pillow if you are still trying to add additional support by putting a jacket on the bottom. Packability is the golden rule. After all, if you can’t pack your pillow, why take it with you at all? Inflatable pillows are the most packable design but may not be the most comfortable. A compression pillow delivers more comfort but may not be as packable as you need. A hybrid could be right what you need, split down the middle. Just ensure that you can easily pack your backpacking pillow and you are good to go. Be aware that some designs are seriously compact, so keep a mind for where it’s stored because you wouldn’t want to lose it! Durability is important because it can mean the difference between restful sleep and nagging aspirations. It would be frustrating if your backpacking pillow popped on the trail. Durability can be affected by the material used in your backpacking pillow. The best backpacking pillows will be made of high-quality materials to ensure that it is long-lasting. A top rated ultralight backpacking pillow should last you forever. Seriously. Your backpacking pillow should either be lost or passed down among the generations. There are many different shapes of backpacking pillows. Some designs are a traditional square shape and others have been specially made to be contoured. There are shapes reminiscent of kidney beans and others have a shape uniquely their own. There isn’t one shape better than others because it all comes down to personal preference in what a person finds comfortable. Lift is important because it can determine how much support the backpacking pillow delivers for you neck and head. Sleeping on the ground isn’t the most comfortable, but a great backpacking pillow will keep your head elevated. 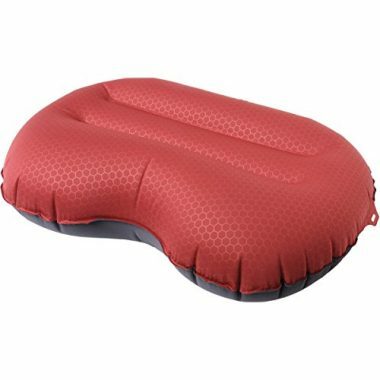 Inflatable or hybrid backpacking pillows can be great because the lift can be customized depending on how much air is inflated into the bladder. If you are prone to a sore neck, you should find a backpacking pillow that delivers generous lift and some extra padding to keep you comfortable on the trail. Q: What is a backpacking pillow? A: A backpacking pillow is a pillow that comes in a compact and portable design. Backpacking pillows are the modern solution to bringing a home comfort on the go. If you’ve ever slept without a pillow or stuffed a jacket under your head, you know it’s uncomfortable and leads to a poor night’s sleep. Backpacking pillows seek to deliver comfort on the trail in a design that can be easily added to your backpacking gear. Backpacking pillows are durable and versatile enough to be used on any trip to any destination. The best backpacking pillows will compact themselves into a size so small, you can even risk losing it. You can even invest in compression sacks to pack backpacking sleeping bags and pillows. Remember where you stashed your pillow and keep an eye out, so it doesn’t get accidentally lost! Q: How are they different than your everyday pillow? A: If you’ve ever tried to stuff an everyday pillow into a small space, you’ll know it can be quite the challenge. A backpacking pillow is different from an everyday pillow because it can be easily taken on the road. Backpacking pillows are lightweight and compact, even more so than camping pillows. They are designed to take the comforts of home, on the road with you. Backpacking pillows eliminate the hassle of trying to pack and bulky item. With a backpacking pillow, you don’t have to sacrifice the comfort of an everyday pillow when you head out for a night on the trail. Q: Is a backpacking pillow necessary? 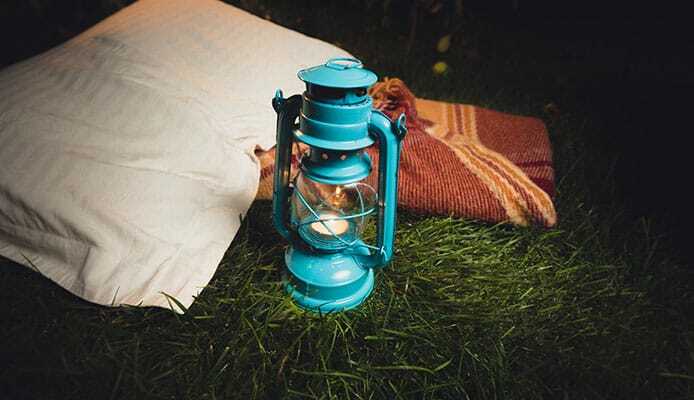 A: No, backpacking pillows aren’t necessary, but they can greatly enhance your night on the trail. A backpacking pillow is gear that won’t save your life, but it is up to personal preference. If you struggle to have a good night’s sleep when you’re out on your adventure, a backpacking pillow can be a great investment and item to have with you. For some campers, a backpacking pillow will be deemed necessary because of the level it comfort it brings to their trip. However, backpacking pillows can also be used to camp. 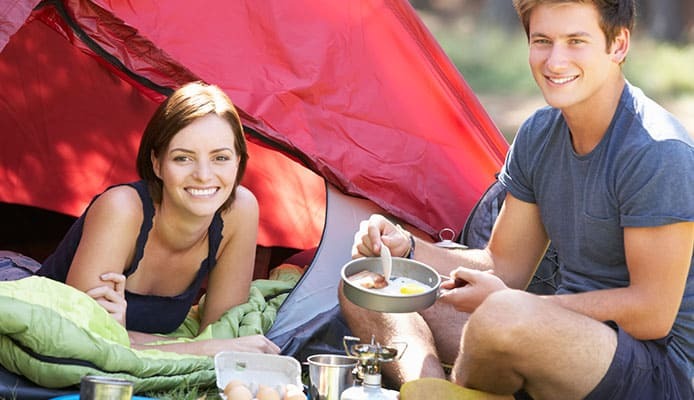 They can easily be added to a camping checklist and if you are camping for beginners, they can be even more comfortable. As well, camping with kids and camping with a baby can become even easier because everyone won’t whine about being uncomfortable. And, if you’re wondering, it can be great for car camping. Other people add it to their list of car camping gear and consider pillows to be a great addition to their camping gear and gadgets. Plus, since you are already using sleeping bag storage and bringing along sleeping pads, you can easily add a pillow to the mix. A backpacking pillow can also make a camping air mattress more comfortable. When it comes to your backpacking pillow needs, finding the best backpacking pillow is important. A great backpacking pillow can add comfort when you want to spend time on the road. With a backpacking pillow you can rest easy. A top rated backpacking pillow will last you throughout the years. In fact, that you should be able to pass it down through the family. If you know exactly what you need and want, you can save time and money by investing in the best backpacking pillow for you! Do you own one of the backpacking pillows that made it onto our list? Let us know how it has worked for your outdoor needs in the comments section below.